It gives me a wonderful feeling of accomplishment when I think of all the cameras I have worked on and sold over the years. My goal with each has been to cure any bronze disease and to make the camera a working camera again. I adjust and lubricate these gems with the idea of extending their lives for another hundred years. I often fantasize about some unknown person from the future, a century from now, cranking and demonstrating one of these cameras. It makes an interesting fantasy! These cameras are survivors. So many did their job and then became obsolete and useless, thrown onto shelves, into closets, attics, warehouses and garages. Never having been many to begin with, these survivors, once lost and now found, have become inherantly more valuable. It's hard to conceive of how rare some of them are. Take for example the Williamson Tropical model. Williamson probably never made more than four hundred cameras in all. Less than a hundred of them would have been Tropical models. How many have survived? After all the years of buying and selling, viewing other private collections and those in museums, my guess is that there are only around twenty five or thirty of that model left in the world. When working on these cameras I used to wonder what each had shot. I stopped doing that a few years ago because too often there was no answer to be had. Only two of the cameras I have had came with a history. In a few cases, such as with some Bell & Howell 2709's, I was able to find out who the original buyer was, and nothing more. Some cameras had owner's names scratched into the wood somewhere. Some have cameramen's notes written on the magazines, like "Tested good" and the date. Most often I just get a feeling of what the camera saw in it's lifetime bylooking at the wear on the mechanism and the patina of the wood and paint. I really like seeing the conversions a camera has gone through as improvements are done through out it's working career. All of thesecameras are true veterans of the motion picture industry. Interestingly enough some cameras are yet to be through with their working careers. I have sold many to working cinematographers who use them today. A prominent Hollywood director recently shot most of a TV Series Pilot with a modern PanaVison camera and two hand cranked cameras, one dating from around 1909. An Akeley Pancake from around 1917 and a 2709 from around 1920 make up the collection of an award winning director of photography who shoots something with them each every year. Steven Spielberg has a wonderful Bioscope that had been a favorite of mine. I'm sure it will make it down through time. There is a wonderful Pathe that works through a camera rental house in Mexico City. When not on a job it sits on display in a special place for all to see. I do not consider the buyers of these cameras to be their "owners", but instead their caretakers. I believe a new buyer is actually paying a fee for being a caretaker. The buyer's job will be to get that camera on to the next caretaker and into the next hundred years. 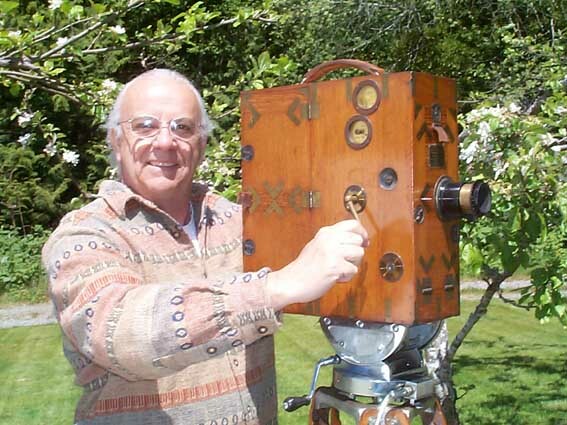 Today, on the contemporary Hollywood scene, commercials and music videos have become a great place to demonstrate the ability of these old hand cranked cameras. Come on into the web site and look around. You'll find there is something here for everybody; student, historian and caretaker alike.